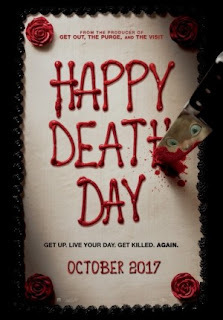 Mike's Movie Moments: Happy Death Day - How to Solve Your Own Murder While Reliving The Day? Happy Death Day - How to Solve Your Own Murder While Reliving The Day? Yesterday my wife and I got the chance to see this movie on its premiere day in Indonesia. I have been eyeing to see this one after I saw the trailer to it weeks ago as it was truly interesting. It was a good thing that I was not too busy and able to leave the office on time to see this movie as the rain was quite heavy and usually Jakarta's traffic would be hell. My wife also finished her food tasting event early and both of us reached the cinema location 1 hour before the 7.15PM show in Setiabudi. Ok, let us shall go on with the movie now. A college student named Theresa aka Tree (Jessica Rothe - La La Land) woke up in a male's dorm room occupied by Carter (Israel Broussard - Flipped, The Bling Ring etc) feeling the worst hangover and could not remember anything from the night before. She immediately rushed out of the room and went back to her own place where she met her friend Danielle (Rachel Matthews) and her roommate Lori (Ruby Modine) who knew it was Tree's birthday. She also went to the class where he met with her lecturer Gregory (Charles Aitken) and continued with her activities till night while ignoring calls from her father (Jason Bayle). Before she reached back home though, she was murdered by a person wearing mask and suddenly woke up in Carter's room again. Feeling disoriented and confused, Tree relived the day without realizing that she had been in a loop until the time when she died for the second time and awake in the same place. She finally realized that for her to cut the loop, she had to find out who wanted to kill her (which seemed to be quite a lot as she was not the best person to be friends with, not to mention being selfish and self centered). So who could be trying to murder Tree among all the possible suspects? Could she finally find out and stop the loop from happening before she ran out of lives? Find them all in this very interesting unique slasher movie. Well it has been a while since I saw a slasher movie that I truly enjoyed. I used to love these movies back in the 1990s and saw most of the then-famous movies like Scream quadrology, I Know What You Did Last Summer and its sequel and few others. But I noticed that there were not a lot of such movies after that which were really intriguing and enjoyable. That is until this movie appeared. What my wife and I loved about the film was the way the movie makers successfully combined the usual stereotype slasher movie with a loop/reliving situation and made us feeling intrigued plus having fun at the same time (those loops that Tree experienced in the middle were just crazy but also very natural for a young person to experience). In a normal slasher movie, the killer would keep on murdering people until left with one or two characters, but in this movie, the killer keep on murdering the same people over and over again. So yeah, you get the picture why I think the writer (Scott Lobdel) & director Christopher B. Landon who also directed Paranormal Activities: The Marked Ones and Scouts Guide to the Zombie Apocalypse were very creative in making such an original plot. Even the title itself was also very creative, the total opposite of Happy Birth Day. And for such a low budget movie, this one surely is a commercial success. As for the who did it part, it was also fun for us audience to keep guessing (though my wife and I had the same feeling of the culprit due to a clue that we noticed). And of course being a slasher movie, there were frequent times where we were quite intense when or how the next murder going to happen. Jessica Rothe's performance here was also nice to see, as she could portray a character that was different in the beginning and in the end, plus of course the way she handled her murderer. The repeating day that Tree experienced was a lot like the main plot in a very famous movie from the 90s titled Groundhog Day with Bill Murray as the lead character. It was referenced nicely here and I think is a good thing for the director to give tribute on such a good movie which no doubt inspired him to make this. Btw, I do not think this movie is good for children, which is why I was surprised to see a child brought by his parents to see the movie. My wife and I were confused by it. Even though the movie was not too gory, but I think the murdering part was a bit strong and violent for a child and Indonesian censorship categorized this as for Adults. Anyway, for such kind of movie, I think this one is very good and unique, unlike anything we have seen before. My wife and I enjoyed it a lot and we would recommend this to be seen in the theaters near you. But for people who prefer to see a very bloody gory slasher movie, then this one might not be too satisfactory. The choice is yours. This year I have seen 3 movies, including this one, about reliving a same day again and again. The other two are Before I Fall played in May at 21 chain and A Day (Korean movie) played this month at Cinemaxx and CGV Blitz chains. I would say Before I Fall is the best, A Day the second, and Happy Death Day the third (though it is not bad). A Day is a bit different as there are 2 guys repeating a same day. And I specially like the little girl in that movie. Very beautiful and good acting too. Before I Fall is a teen drama but not about love. The genre I hate most is love drama. I saw this movie twice. Rarely I see a film twice because no matter how good it is, it becomes uninteresting when you see it the second time as you already know what’s coming next. The last film I saw it twice is The Great Wall. I like Zhang Yimou’s films as they are always colossal and entertaining. But the reason I saw it twice is at that time I had seen all movies playing at cinemas and no more new movie to watch. But this time is different. I like one of the songs of that movie. When the movie finished, I still looked at the screen noticing those rolling-up scenes introducing who played as whom, who were the cameramen etc. hoping the names of songs would also appear. They did appear but to my surprise there were 13 songs so I could not remember them all. So I watched that movie again and asked a friend to accompany me to write down 6 song names while I myself wrote the remaining 7. By knowing all the song names, I could then search one by one at YouTube. A Day is a mystery drama about why a taxi driver intentionally killed a girl kid. This kid, casted by 12-year-old Eun Hyung Jo, is really pretty that I almost saw this movie a second time just to see her. I think you can get the movie online, just don’t know whether you can get one with Indonesian subtitle. two thumbs for your commitment in searching for the song and glad u could find it. All right, will definitely search for those two movies online and write them up once I got the chance. Btw, I think u have a knack for writing, perhaps u do write? Anyway, thanks again for taking the time to read my blog.